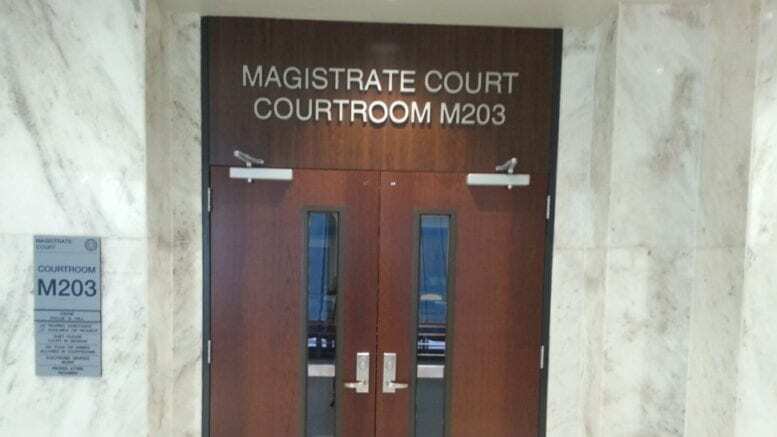 At a hearing last Tuesday, Magistrate Court Judge Gerald Moore found probable cause to bind Jayvon McCoy of Kennesaw over to superior court for trial on charges of first-degree home invasion, aggravated battery, and armed robbery. The alleged incident occurred in December of 2018 on Rustic Ridge Dr, Kennesaw. According to testimony from Detective Schrager of the Cobb County Police Department’s Crimes Against Persons Unit, the two alleged victims told him that several men, all but one of them wearing ski masks, and two of them carrying pistols, entered a doorway to one victim’s bedroom in the lower level of the split-level house owned by the father of one of the victims. They identified the suspect not wearing a mask as McCoy, who had been friends with the first victim in the past. According to testimony, the second victim attempted to push the alleged intruders back toward the door, and was hit with one of the pistols, and struck by multiple attackers when he fell to the floor. Several bones in his face were broken, and his eye was swollen affecting his vision for weeks afterward. The owner of the house, , hearing the noise, came down the stairs and shouted, and the alleged intruders fled. According to testimony a baggie of marijuana was taken from the room by the home invaders. McCoy’s defense attorney, Charles Harbin, called a number of witnesses, including the two alleged victims, the owner of the house, and McCoy’s sister and brother-in-law. Assistant District Attorney Katie Southmayd objected to the victims being called to the stand. She said since hearsay is admissible in probable cause hearings, the detective could testify to anything the victims had reported. Harbin said that the accused has a right to call witnesses. Moore called Harbin and Southmayd forward to the bench to discuss the matter and ruled that Harbin could call the victims and other witnesses to the stand. The two victims gave similar accounts, except the second said he and the first victim were not smoking the marijuana before the incident, and Barbosa said they had been smoking it. McCoy’s brother-in-law testified in court that McCoy had been with him at the time of the alleged crime. Detective Schrager stated that this conflicted with the brother-in-law’s earlier statement to him. Harbin closed arguing that no probable cause should be found to send McCoy to trial due to differences in the timelines witnesses presented. In finding probable cause, the judge said that both victims and one of the other suspects who had been arrested placed McCoy at the scene of the alleged incident, so there was sufficient cause to bind him over for trial in Superior Court. During the bond portion of the hearing, Harbin called McCoy’s mother to the stand, and asked if McCoy would be living with her if he were given bond, if family would make sure he showed up for court appearances, and if the family would pay for an ankle monitor. She answered yes to all three questions. Be the first to comment on "Kennesaw home invasion suspect to stand trial"